MK Betzalel Smotrich skips Knesset vote, visits Khan al-Ahmar in protest against delay in evacuation of illegal Bedouin outpost. 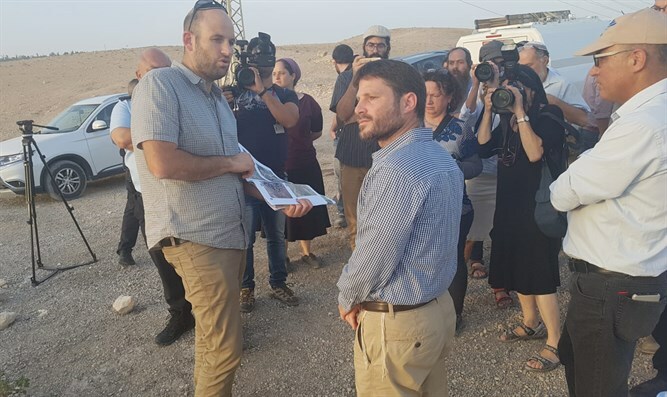 MK Betzalel Smotrich (Jewish Home) visited the illegal Bedouin outpost of Khan al-Ahmar on Monday, instead of voting in the Knesset plenum, in protest against the delay in the evacuation of the outpost. "Khan al-Ahmar has become a test of sovereignty and the ability of the State of Israel to stand up to its important interests in the face of international pressure that is hypocritical and tendentious," Smotrich said. He added that "the interest in this area is clear and it is not for nothing that the Palestinian Authority invests every effort in it, while cynically and brutally using the Bedouin residents. This interest requires the evacuation of the outpost and every day of submission to international pressure will only invite more pressure on us." Smotrich sought to convey a message to the coalition parties. "As members of the coalition, we bear responsibility for its actions and therefore can not make do with talk and protests." "If more and more members of the coalition understand that this is a test that can not fail, they will use their power as I did today. The prime minister will have to consider these votes in the coalition and order the evacuation here and now."